Through all that we have discussed in both Fashion Studies lecture and recitation, dress practice has been something I have begun to think about more often. I have realized that dress is a physical display of both circumstance and choice giving the wearer complete autonomy over what they choose to display and why. Given the intricate nature of the constant sense of motion displayed in my sister’s schedule, I chose to center my interview on the relationship of the stable and moving parts of the people and things around her and how they play a role in the way she dresses. 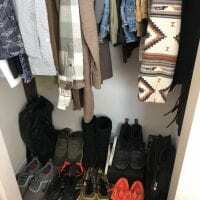 One theme that emerged was, what makes a closet a closet in terms of space and location? Another theme was the importance of comfort and practicality in dress. One thing I noticed about my sisters daily dress practice was that it was very simple. In comparison to mine, which has simplified due to weather and my schedule; hers is still less complex. In terms of subject positions I would consider us to be quite similar however, I believe our different fields of study and occupation result in the difference between our dress practices. As the interview progressed I became more interested in the actions surrounding dress as opposed to the physical garments. This revealed that action and clothes work hand in hand to create ‘dress.’ “For Goffman, as for Douglas, the body is both the property of the individual and the social world: it is the vehicle of identity but this identity has to be ‘managed’ in terms of the definitions of the social situations which impose particular ways of being of the body. Thus, the individual feels a social and moral imperative to perform their identity in particular ways and this includes learning appropriate ways of dressing. (Entwistle 2002, 139) As explained in the previous excerpt, the way a person decides to dress can be a result of a plethora of different factors, especially social situations. Like my sisters reasoning for the way, she dresses the events and the people that surround you most definitely play a role in the way one decides to dress. Evidently, from this interview, I myself have learned to examine things beyond the surface because underneath all the obvious layers there is so much more we can learn and discover.